This memoir reveals an underside of being a preacher’s kid, a public role that is rife with challenges of supporting your minister father and your minister’s-wife mother and of becoming yourself, a person they may not have expected their household to have produced. Relationships in this memoir are portrayed honestly and sometimes not flatteringly. A Sugary Frosting, a phrase derived from Martha Blowen’s journals, is a memoir of surviving religious idealism and inherited belief to undertake to become one’s self. A Sugary Frosting is a step through the 1950s and 1960s that will bring the life of those years to the fore—at least as it was lived in a parsonage. •	the viciousness of the “White Church” whose members sent hate notes to the minister. •	the minister’s “cunnin’ ” little girl showing her rosebud petticoat to the church ladies. •	women going to church wearing gloves—even in summer. •	the minister’s daughter smoking pot and telling her parents it was incense. •	what it felt like to be a talented lyric soprano and not wanting to sing. •	going to the elite Milton Academy and hating it. •	being bullied by a high school teacher. These—and more—stories, told artfully and insightfully, will keep you reading long past when you should be asleep. Download A Sugary Frosting / A Girlhood Spent in a Parsonage now. The financial investment is small, and the satisfaction will be great. 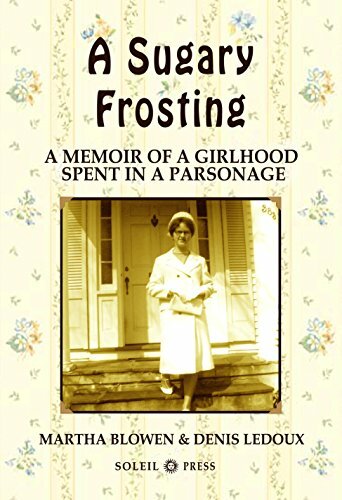 This is the Kindle version of A Sugary Frosting: A Memoir of A Girlhood Spent in a Parsonage and How I Survived Being a Preacher’s Kid (The Cancer Books Book 2) that you can also download and read on your computer and mobile phone. Kindle books are DRM protected and therefore, unlike ebooks that are in PDF or ePUB format, you cannot read this ebook without the official Kindle apps.